The bruschetta that I have started making since moving to Sicily is topped with a mixture of chopped cherry tomatoes, garlic, basil, crushed red pepper, olive oil, salt and pepper and just a tiny splash of balsamic vinegar. You can use any kind of Italian or french bread as long as you slice it and either grill it or toast it under the broiler on both sides. It’s a simple appetizer that always tastes amazing. Today for lunch I decided to experiment with a couple of new flavors in my bruschetta. I ended up making three versions: my original (bruschetta al pomodoro), a Greek-inspired version (bruschetta greca), and a Mexican-inspired version (bruschetta messicana). I loved them all so I can’t tell you which one tastes best. I guess you will have to try them yourself and see what you think! I always make the topping before toasting the bread so that the flavors can mingle and a nice amount of juice can collect in the bottom of the bowl while it sits for a few minutes. When you put the topping on the bread, spoon on that extra juice so that the bread can soak it up. They all look good but anything with cilantro in it gets my vote, although feta can't be far behind. I think I will have to try all three asap. Bruschetta Greca, no doubt. If it's got black olives, I'm so there. Your picture is very elegant and I'm sure these taste amazing. Bruschetta is definitely a favourite appetizer, how can you lose with something that looks nice, is easy to prepare, and most importantly, tastes great? nicole, I missed the farmer's market Saturday but I will definitely try this next weekend. The Messicana sounds like home ! Oh, question, Nicole- do you brush the bread with olive oil after toasting or just load up the topping ? Normally i'm not a big fan of bruschetta, but this looks so good! I have to try these sometime! Kathy: I don't brush the bread with olive oil at all. I just load up the topping and the olive oil and tomato juices soak into the bread. They all look so good! Guess I will have to try them all. Nice way to say goodbye to Summer. yummmm...one of my most snarfable items. Well ... if summer must go then I'd like to say goodybe with this bruschetta. Lovely! The pictures are very appealing. Time to make dinner! But I don't think it could be as good as the food items you have in your pictures. I was recently intruduced to bruschetta, the tast is amazing! I will defintely try your three variations and look forward to visiting your site again. Good job! Your varied Bruschettas (prounounced Bruce-ketta) are all bang on...I love it! what happened to this site ... is it still active .... the last comments i see are from 2007 ....nicole ... do you still keep up with this site? Love bruschetta and make it with whatever I happen to have- feta cheese, onions, avocado, tomatoes, fresh garlic, olive oil... Your recipes sounds perfect. This recipe look so yummy. 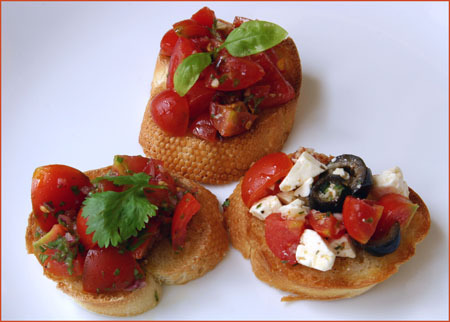 I will definitely try to make this bruschetta entry's before Christmas. Thank you for excellent idea.